In 2010, the Democrats passed the Patient Protection and Affordable Care Act (Obamacare) without a single Republican vote. Obamacare mandates that all Americans, except for members of Congress, buy health insurance or pay a fine to the Internal Revenue Service (IRS). President Obama and Democrat members of Congress repeated the lie “If you like your health care plan, you can keep your health care plan” on multiple occasions in a pitch to promote this law during the 2012 Presidential election. However, Senator Kirsten Gillibrand (D-NY) admitted that Democrats knew that millions of Americans would lose their health insurance as a result of this law. Former Congressman Barney Frank (D-MA) also knew that Obamacare was sold on a lie and is appalled at President Obama for blatantly lying to Americans. Yet Gillibrand, Frank and their colleagues voted to impose Obamacare on us. 65 million Americans could lose their employer sponsored health insurance. The law also contains 21 tax increases, including 12 increases on middle class Americans. The Congressional Budget Office (CBO) confirms that Obamacare is a $1 trillion tax hike that Americans cannot afford. Obamacare is more unpopular than ever. The Democrats did not seem to receive that memo. Forcing Americans to buy health insurance that they do not want or face the wrath of the IRS does not mean that Obamacare is working. Uninsuring the insured to insure the uninsured does not mean that Obamacare is working. We have seen the effects of this disastrous law: large companies are cutting back on hiring more workers, employers are reducing hours employees may work, employers are sending their employees to the Obamacare exchanges rather than provide them health coverage, young Americans are not signing up for the exchanges and older and sicker Americans are experiencing soaring premiums as a result, people are losing their jobs, insurance premiums are increasing across the board, etc. If this were not bad enough, Americans’ private health and financial records are becoming part of a national database. There is even hidden code in the healthcare.gov site stating that applicants have “no reasonable expectation of privacy.” Make no mistake: Obamacare is not about health care. It is about government expansion and control of its citizens, bringing us one step closer to the fundamental transformation of America. As the communist revolutionary Vladimir Lenin said, “Medical care is the keystone in the arch of socialism.” After being instituted, no country has ever reverted from a government-run healthcare system back to a free market healthcare system. The goal of Obamacare is to take away our freedom and give it to the all powerful in Washington, DC. 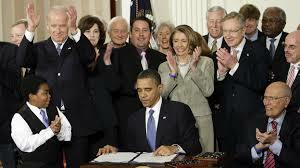 We have Obamacare because in 2009 Democrats controlled the White House, the House of Representatives and the Senate. Democrats passed Obamacare even though they knew that if we liked our health care plans we could not keep our health care plans. Many conservatives have legitimate issues with Senator Mitch McConnell (R-KY). However, McConnell presided over a Senate minority in which every single Republican Senator voted against Obamacare. Obamacare passed because voters stayed home on election day. It is imperative that we rid Democrats of control of the Senate this November. If we let Democrats win just to teach Republicans with whom we are dissatisfied a lesson, then what we are effectively doing is sending the message that voters like Democrats and therefore Republicans need to be more moderate, pushing our country further to the left. Beating those who are fundamentally transforming America is all that matters. Democrats and only Democrats brought us Obamacare. Remember that this November.